There was a time when our ways were intimately woven with the pulse of the natural world. The answers to life's great questions were found not in books but in quiet communion with the voices of Mother Earth. From the mighty whale to the tiny bee, each animal and element was seen as sacred and was honoured for the gift it brought to the greater circle of life. The Secret Language of Animals is a doorway to reconnect with the wisdom of nature through the messages of a handful of our planet's most threatened species. By honouring the insight they bring to us, we deepen our connection to our own path and calling, while awakening our role in the preservation and balance of life. Now is the time. 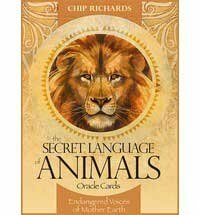 Listen to the whispered call of the Secret Language of Animals... what message or gift is waiting to be awoken in you? Includes 168 page book. 46 cards. Card stack is 5 1/2" x 3 3/4" x 3/4"
There was a time when our ways were intimately woven with the pulse of the natural world. The answers to life's great questions were found not in books but in quiet communion with the voices of Mother Earth. From the mighty whale to the tiny bee, each animal and element was seen as sacred and was honoured for the gift it brought to the greater circle of life. Listen to the whispered call of the Secret Language of Animals... what message or gift is waiting to be awoken in you? Includes 168 page book. 46 cards. Card stack is 5 1/2" x 3 3/4" x 3/4"